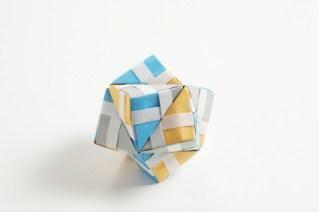 Modular origami is an especially difficult form of origami. It involves making several pieces of origami that eventually fit together into one larger unit. Folders of all levels rely upon precise diagrams in order to create pieces that fit together flawlessly when making modular origami figures. Many useful origami websites offer plenty of easy origami projects, but usually it's only the experts tackle the difficult 3D modular designs. If you want to create a modular unit but are still in the beginner to intermediate level, look for larger modular units that have simple origami pieces that fit together into an impressive unit. This way, you can create awe-inspiring creations without waiting for your skills to catch up to your folding desires. Modular origami diagrams and instructions are available both online and in helpful books that offer step-by-step origami directions. The Braid has a colorful crease pattern and photo tutorial for making Fumiyaki Kawahata's Modular Ball. Blue's Chinese 3D modular origami has a diagram posted for a modular swan. Directions are in Korean, so it is extremely important to follow the diagram closely. Origami Nut has four pages of modular origami designs, many with video, that range in skill level from beginner to advanced folder. Origami Resource Center has a list of links to modular diagrams and instructions online. The links are organized by category, such as ball models and strip origami, making it easy to find exactly the model you seek. Online origami diagrams are useful if you are not sure if your skills are up for the challenge of folding modular figures. However, if you discover a love or knack for these designs, consider picking up an entire book filled with diagrams and tutorials. Beginner's Book of Modular Origami Polyhedra: The Platonic Solids by Rona Gerkewitz and Bennett Arnstein includes 17 models perfect for someone new to folding modular origami. 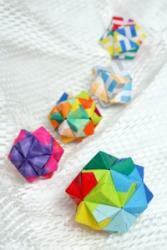 Marvelous Modular Origami by Meenakshi Mukerji includes over 30 models. Ornamental Origami: Exploring 3D Geometric Designs by Meenakshi Mukerji focuses on unit origami that is perfect for decorating or using as ornaments in your home. Unit Origami: Multidimensional Transformations by Tomoko Fuse offers up her expertise in this book of figures. Before you begin folding a modular origami project, it is important to understand the importance of making exact folds and creases. Inaccurate folds in a simple origami figure make a project look rough and unfinished. In a modular design, inaccurate folds mean that your pieces may not fit together and you have to refold or recreate many of the unit pieces. To avoid any unnecessary problems when making modular origami, practice the main units several times before you begin putting the pieces together. Also, study the diagram closely to see where each piece fits into the next. Diagrams will show how each piece fits with one another better than any written instructions could explain it. Once you have mastered the art of making another person's diagram come to life in paper, consider folding your own unique modular piece. It is imperative to write down the instructions and diagram the steps, as you may end up needing to reference them along the way. The process is likely to be long and arduous, but the final result will be worth the time. Having your own model and diagram is a wonderful way to share your talents with others.